Delhi, the capital of India, has a rich history. The city is dotted with spellbinding mosques, forts, and monuments left over from the Mughal rulers that once occupied the city. The contrast between rambling Old Delhi and well planned New Delhi is immense, and it's interesting to spend time exploring both. If you feel in need of some relaxation, just head to one of Delhi's flourishing landscaped gardens. Here's a list of the top attractions and places to visit in Delhi. The great thing is that many of them are free! (And can easily be reached by Delhi's Hop On Hop Off bus). Or, take one or more of these popular Delhi Tours. Got children? Also have a look a these 7 Fun Things To Do in Delhi with Kids. Like walking? Check out these Top Walking Tours in Delhi. And, once you've seen enough monuments, try these 15 Offbeat Things to Do in Delhi. We also have handy itineraries for 48 hours in Delhi and one week in Delhi. Delhi's most famous monument, the Red Fort, stands not only as a powerful reminder of the Mughal era India but also a symbol of India's struggle for freedom. It was build by fifth Mughal emperor Shah Jahan, when he decided to shift his capital there from Agra in 1638. The fort's turbulent history includes being captured by the Sikhs and the British. To take your imagination back to the ancient era, a one hour sound and light show of the fort's history is held each evening. Location: Opposite Chandni Chowk, Old Delhi. Entry Cost: Foreigners, 500 rupees. Indians, 30 rupees. Free for children under 15 years. Opening Hours: Sunrise until sunset. Closed Mondays. Jama Masjid is another marvelous treasure of the Old City, and it's one of the largest mosque in India. Its courtyard can hold an incredible 25,000 devotees. The mosque took six years to build, and was completed in 1656. A strenuous climb to the top of its southern tower will reward you with a stunning view (albeit obscured by metal security grills) across the rooftops of Delhi. Be sure to dress appropriately when visiting the mosque or you won't be allowed in. This means covering your head, legs and shoulders. Attire is available there. Location: Opposite Chandni Chowk, Old Delhi. Near the Red Fort. More Information: Complete Guide to Delhi's Jama Masjid. Chandni Chowk, the main street of old Delhi, is a shocking contrast to the wide, orderly streets of New Delhi. Cars, cycle rickshaws, hand-pulled carts, pedestrians, and animals all compete for space. It's chaotic, crumbling and congested, but completely captivating as well. As one of the oldest and busiest markets in India, its narrow winding lanes are full of inexpensive jewelry, fabrics, and electronics. For the more adventurous, Chandni Chowk is an excellent place to sample some of Delhi's street food. The renowned Karim Hotel, a Delhi dining institution, is also located there. Location: Old Delhi, near the Red Fort and Jama Masjid. A relatively new attraction, this massive temple complex was built by the BAPS Swaminarayan Sanstha spiritual organization and opened in 2005. It's dedicated to showcasing Indian culture. As well as the astonishing architecture of the pink stone and white marble shrine, the complex includes sprawling garden, sculptures, and boat ride. Allow plenty of time to explore it thoroughly -- at least half a day. Do note that cell phones and cameras are not permitted inside. Location: National Highway 24, near Noida Mor, New Delhi. Entry Cost: Free. However, tickets are required to view the exhibitions. Opening Hours: 9.30 a.m. until 6.30 p.m. (last entry). Closed Mondays. If you think Humayun's Tomb looks a bit like the Taj Mahal in Agra, that's because it was the inspiration for the Taj Mahal's creation. The tomb was built in 1570, and houses the body of the second Mughal emperor, Humayun. It was the first of this type of Mughal architecture to be built in India, and the Mughal rulers followed it up with an extensive period of construction all over the country. The tomb is part of a greater complex that's set among beautiful gardens. Location: Nizamuddin East, New Delhi. Near the Nizamuddin train station, off Mathura Road. Opening Hours: Sunrise until sunset, daily. It's best viewed in the golden light of the late afternoon. Lodhi Gardens provides a serene retreat from city life, and is the place to come if you're feeling tired and worn out. The vast Gardens were built by the British in 1936 around the tombs of 15th and 16th century rulers. Joggers, yoga practitioners, and young couples all enjoy this park. Location: Lodhi Road, not far from Humayun's Tomb. Opening Hours: Daily from sunrise until 8 p.m., but Sundays are particularly busy. 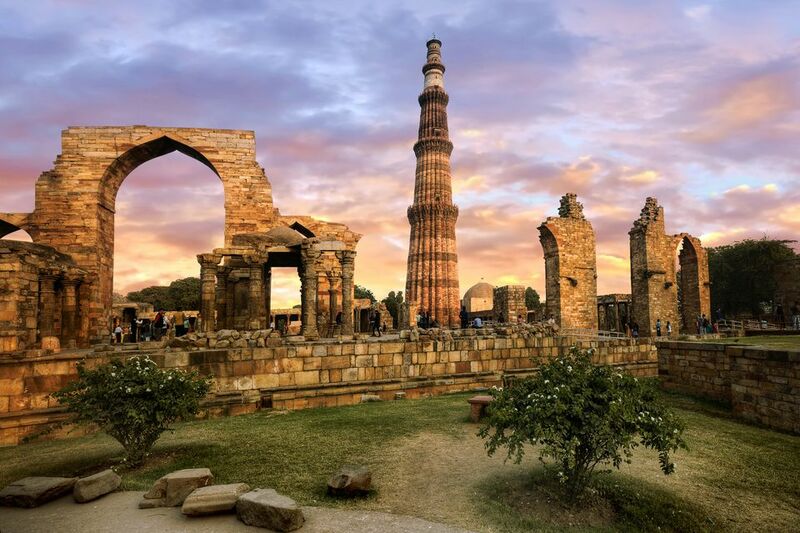 Qutab Minar, the tallest brick minaret in the world, is an incredible example of early Indo–Islamic architecture. It was built in 1206, but the reason remains a mystery. Some believe that it was made to signify victory and the beginning of Muslim rule in India, while others say it was used to call the faithful to prayer. The tower has five distinct stories, and is covered with intricate carvings and verses from the holy Quran. There are also a number of other historic monuments on the site. Opening Hours: Sunrise until sunset, daily. A visit to Gandhi Smriti will show you the exact spot where Mahatma Gandhi, affectionately referred to as the Father of the Nation, was assassinated on January 30, 1948. He lived in the house for 144 days up until the time of his death. The room that he slept in, kept exactly how he left it, and the prayer ground where he held a mass congregation every evening are both open to the public. Plenty of photos, sculptures, paintings, and inscriptions are also on display. You can also visit his memorial at Raj Ghat. Opening Hours: 10 a.m. to 5 p.m. Closed Mondays. The towering archway of India Gate at the center of New Delhi is a war memorial, built in memory of the Indian soldiers who lost their lives fighting for the British Army in World War I. At night it glows warmly under floodlights, and the gardens that line its boulevard are a popular place to enjoy a warm summer's evening. There's also a fun Children's Park that's ideal for kids. The Bahai Temple is commonly called the Lotus Temple, as it's shaped like a lotus flower. It's particularly pretty at night, when it's attractively lit up. Made out of concrete covered in white marble, the temple belongs to the Bahai Faith, which proclaims the unity of all people and religions. Everybody is welcome there. Location: Near Nehru Place, south Delhi. Opening Hours: 9.00 a.m. until sunset. Closed Mondays. More Information: Complete Guide to Delhi's Lotus Temple.